Release the bulb retaining spring. 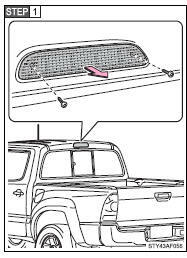 To install a new bulb, align the tabs of the bulb with the cutouts of the mounting hole. Unplug the connector while pulling the lock release. Remove the bolts and rear combination assembly. Unplug the connector while depressing the lock release. Turn the bulb bases counterclockwise. Remove the screws and cover. Remove the screw and light unit. 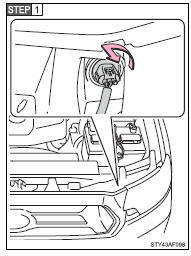 Temporary condensation build-up on the inside of the headlight lens does not indicate a malfunction. 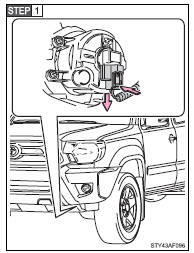 Contact your Toyota dealer for more information in the following situations: ●Large drops of water are built up on the inside of the lens. 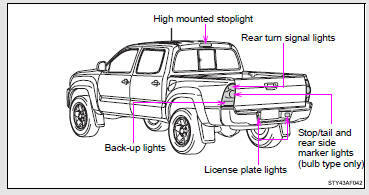 The side turn signal lights (if equipped), stop/tail and rear side marker lights (LED type) consist of a number of LEDs. 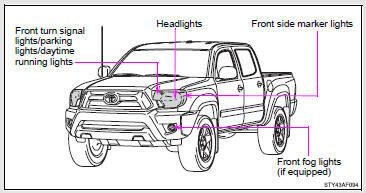 If any of the LEDs burn out, take your vehicle to your Toyota dealer to have the light replaced. If two or more LEDs in a stop light burn out, your vehicle may not conform to local laws (SAE). ●Turn off the headlights. 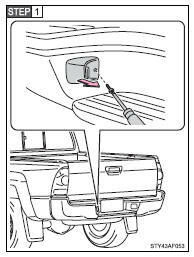 Do not attempt to replace the bulb immediately after turning off the headlights. ●Do not touch the glass portion of the light bulb with bare hands. When it is unavoidable to hold the glass portion, use and hold with a clean dry cloth to avoid getting moisture and oils on the bulb. ●Fully install light bulbs and any parts used to secure them. 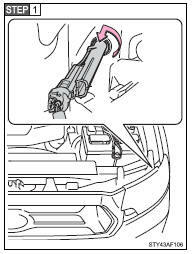 Failing to do so may result in heat damage, fire, or water entering the headlight unit. 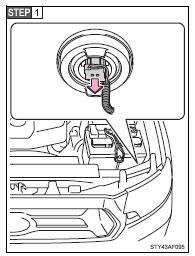 This may damage the headlights or cause condensation to build up on the lens.